Ganesh in Sanskrit means 'multitude'. Isa means 'Lord'. Lord Ganesh therefore literally means the 'Lord of all beings'. Lord Ganesh is the first son of Lord Siva. Siva represents the supreme Reality. The son of Siva symbolizes one who has realized the Reality or the one who has discovered the godhood in Him. Such a man is said to be the Lord of all beings. There is a belief that no undertaking will meet with failure if the grace of Vighneshwara or Ganesha is invoked. In Hindu mythological literature Lord Ganesh is described as having a human form with an elephant's head. One of the tusks in his head is broken. He has a conspicuously large stomach and He sits with one leg folded in. This mystical form of Lord Ganesh represents not only the supreme state of human perfection but also the practical path to reach that state. Continuing with the festive spirit of the auspicious occasion of Shri Ganesh Chaturthi we now launch another superb collection of mantras, stotrams and aartis dedicated to our beloved deity ? Shri Ganesh. 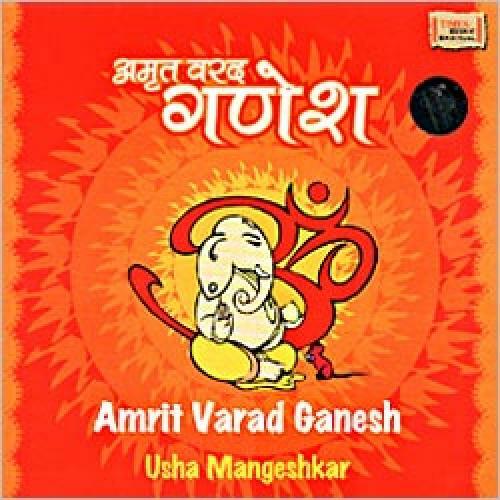 This album contains the unique Atharva Shirsham, Ganesh Stotram, Harida Ganesh Kavacham and other exquisite Vedic mantras like Mayuresh Stotram, 108 Ganesh Namavalli, Ganesh Gayatri, amongst other gems and finally culminating with the resplendent Aarti Prathameshaji Ki. Sung by the most talented Usha Mangeshkar this is a must have compilation for all those who seek the benedictions of the Lord of successful beginnings and the destroyer of all obstacles.